Angel’s Hemp is CBD oil extracted from the finest hemp plants in Colorado. With our product, you get the best. Be careful buying from others. Explained including the types of CBD hemp oil products that you can buy, and the benefits of CBD Oil (how it helps you), and answers to frequently asked questions such as how CBD works and what CBD is best for pain and mind relief. What does CBD hemp oil do for you? Can hemp oil be used for pain? Do drug tests test for CBD? The market for hemp oils/CBD includes products such as CBD capsules and pills, concentrates and oil extracts, edibles and gummies, vape oils, vape pens and topical (skin) CBD lotions. However, we decided as a company to release what we believe to be the most effective CBD oil (250 mg / 15ml) for pain relief, muscle soreness, and anti-anxiety, with a soothing, calming effect. 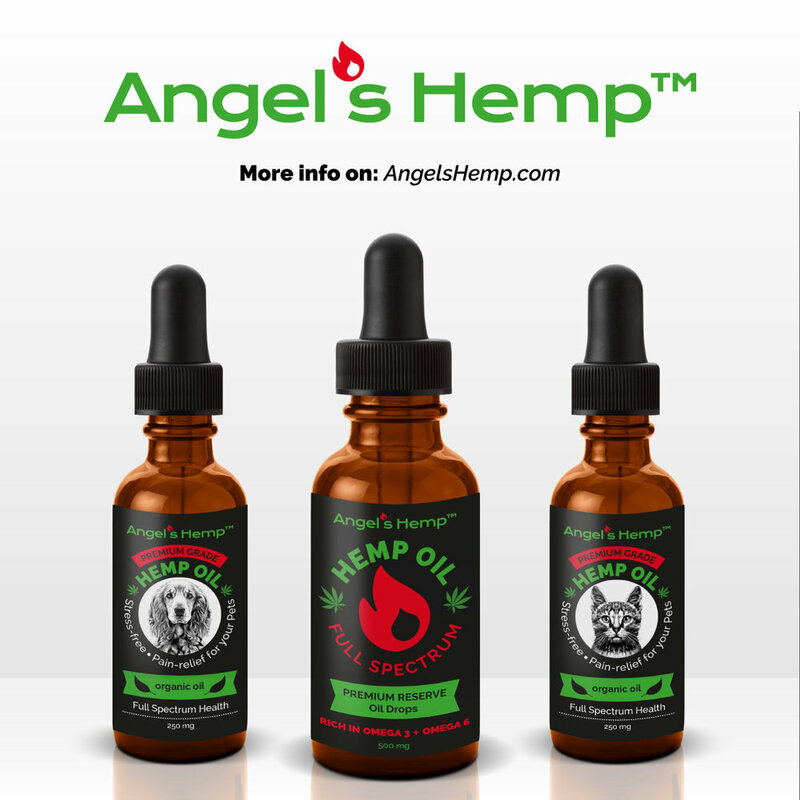 There are several types of CBD products that Angel's Hemp offers, including a oil tincture (CBD) hemp oil, an upcoming human CBD salve, and a variety of pet products. Beyond having a relaxing, calming and soothing effect on you, these oils have 100% organic, vitamin-rich ingredients including essential fatty oils like Omega-3, Omega-6, and Omega-9 vitamins. These essential oils and vitamins, along with a healthy lifestyle, are proven to add years to your life. The biggest benefit you will achieve with CBD hemp oils is the anti-anxiety and pain relief for your mind and body. Imagine if there was an alternative to pain pills and medications that was all-natural, organic and would become essential to your well-being... now you can, with Angel's Hemp oils. Angel’s Hemp is hemp extract, not hemp seeds. Our CBD is pure and THC-Free. Angel’s Hemp is derived from real hemp plants using a CO2 Extraction process. We are not selling hemp seeds, which are ineffective in the treatment of pain and anxiety relief. When you buy from Angel’s Hemp, you get the real thing, not like the others. Of course, we always recommend you consult with a physician before using any supplement or medication, but we continue to hear from people across America, and the World, who have experienced the benefits and healing of CBD hemp oils. According to the Journal, Current Drug Safety, "Cannabidiol (CBD), a major nonpsychotropic constituent of Cannabis, has multiple pharmacological actions, including anxiolytic, antipsychotic, antiemetic and anti-inflammatory properties... several studies suggest that CBD is non-toxic in non-transformed cells and does not induce changes on food intake, does not induce catalepsy, does not affect physiological parameters (heart rate, blood pressure and body temperature), does not affect gastrointestinal transit and does not alter psychomotor or psychological functions. Also, chronic use and high doses up to 1,500 mg/day of CBD are reportedly well tolerated in humans. Conversely, some studies reported that this cannabinoid can induce some side effects, including inhibition of hepatic drug metabolism, alterations of in vitro cell viability, decreased fertilization capacity, and decreased activities of p-glycoprotein and other drug transporters. Based on recent advances in cannabinoid administration in humans, controlled CBD may be safe in humans and animals..."
"Curr Drug Saf. 2011 Sep 1;6(4):237-49." (Excerpt only). We believe that our CBD are not only safe, but that when used in combination of a healthy diet and exercise, can be life-changing for people, and even pets around the world. How CBD Works and Why It Helps with Pain Relief: AngelsHemp.com Explained. CBD oil is generally used for medicinal purposes, treating inflammation, pain, sleeping disorders and even certain types of epileptic seizures. Hemp-seed oil is used as a protein supplement for food, as varnish for wood and, because of its remedial properties for hair and skin, as an ingredient in the lotion and soap products you mentioned." Can CBD hemp oil be used for pain? Yes, CBD oil is excellent for pain relief. From muscle and joint relief to soreness and stiffness, CBD oil is effective in reducing inflammation and easing your pain. Note: as long as the oil is derived from a cultivated hemp plant and then CBD is extracted from the oils of the Hemp plant, this CBD (Cannabidiol) is able to help with your pain management, soreness, stiffness and general fatigue. Make sure to use a product like Angel's Hemp, which is certifiably 100% organic, natural, non-GMO hemp oil with CBD that is more pure than any other products on the market. Enter your email below to receive the Free Ultimate Guide to CBD and Hemp Oils.